How comfortable are you with advanced triggering on an oscilloscope? In my experience, having done training for thousands of professional engineers worldwide, about 90% of oscilloscope users know about only a fraction of the extensive list of advanced triggers offered to them in modern digital oscilloscopes. An autoscale and edge trigger may work well for basic measurements, but for debug and analysis of complex signals or physical layer glitches, advanced triggers can be an extremely powerful tool to help you get your job done faster. Today’s blog will focus on what exactly triggering is, and give you a basic primer on a great webcast that we’ve posted on our YouTube channel (see the link at the end of the article for more). Most signals you are measuring are changing rapidly, thousands or millions of times per second. In order to take that rapidly moving data and present it to you in a coherent manner, an oscilloscope needs a trigger condition. As an example, let’s say I’m a photographer being hired by an equestrian to make a photo gallery of their horses for sale. Potential buyers, who will be viewing the photos, will want the photos to all have the same frame of reference so they can compare the sizes of each horse. If each horse’s photo is taken from different angle and distance, then comparing the photos to each other to see differences is basically impossible. But, if I take each photo from the left side at a distance of 5 meters, then the differences between the photos are clear so the buyer can make an informed decision of what horse they want. What if I am interested in one of these signals in particular? The rising edge trigger rule is not specific enough. That’s where advanced triggers come in: we need a more specifically defined rule to see exactly what we’re interested in! Advanced triggers require some knowledge of the signal you’re testing, its shape and parametric qualities, as well as how to set the oscilloscope up properly. This is can be very difficult or nearly impossible for most scope users. Zone trigger was designed as a point and shoot system for isolating difficult signals within your design. This topic is covered in the webcast, or you can watch this video to learn more. Read more about how oscilloscopes can decode serial data and find the product datasheets in this blog article. Life in the time domain is often a noisy one. And noise means triggering becomes difficult. For example, why is the scope triggering on rising and falling edges of the noisy signal below? If you zoom in, you’ll see that the falling edges of the sine wave contain small rising edges within it, that are large enough to qualify the oscilloscope to trigger. We cover all the different trigger modes and coupling techniques that can be used to make a more stable trigger in an unstable environment. You might also try bandwidth limiting, as described aptly by Melissa here! Advanced triggers can be difficult to master, and times when you need them are few and far between. Zone trigger can take a lot of that headache away, which is great. Mastery of the advanced triggers in oscilloscopes can not only separate the true power users from the rest, but also take your ability to solve problems in complex designs to a whole new level. Isolating a problem signal allows you to dive deeper in your debug process and fix bugs faster. Check out the recorded Advanced Triggering and Signal Isolation webcast on our YouTube channel. Battlefield scenarios can set up competing forces for radar/EW designers as well. Many seconds or minutes may go by as a scenario plays out with a clear winner and *****. But emulating this scenario with multi-emitter signal sources and multi-channel receivers is nontrivial. Designers need wide analysis bandwidth in measurements on hardware; they also need to evaluate a significant time period of system activity. Given this conflict, this class of pulsed RF, microwave, and mmWave applications presents a challenge. On the signal source side, the technique of using pulse descriptor words (PDWs) is changing the game with regard to throughput and real-time signal creation. On the receiver side, if direct digitization techniques are used for amplitude and phase flatness advantages, as is the case when using some high-bandwidth oscilloscopes, the related high-speed sampling approach will burn through acquisition memory very quickly. But “segmented memory” can save the day: Signals of interest are placed into memory segments, and the receiver ignores the time when signals of interest are not present, as shown in Figure 1. Figure 1. The segmented memory approach, where signals of interest are stored into memory segments. This blog post explores how segmented memory in wideband oscilloscopes can be used through pulse analysis software. We’ll address the application area of Radar/EW in terms of pulse amplitude, frequency, and phase measurements, and how you can optimize accuracy. In most basic pulsed RF measurements with an oscilloscope, you take measurements on a single RF pulse from a pulse train or on a limited number of pulses. And that makes sense—a fast sample rate (adequate to capture carrier plus modulation without aliasing) uses up the scope memory depth quickly. Consider an example where a pulsed RF signal has a 15-GHz carrier frequency and 2-GHz-wide modulation. 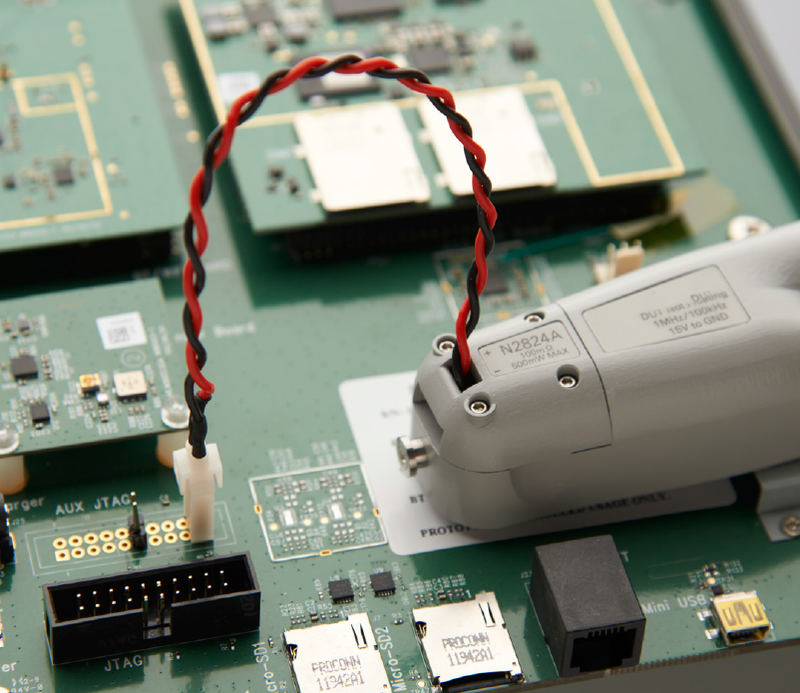 The oscilloscope must sample fast enough to handle the modulated 15-GHz RF pulse signal. That requires a sample rate of at least ~ 2.5 x 16 GHz, or 40 GSa/sec. 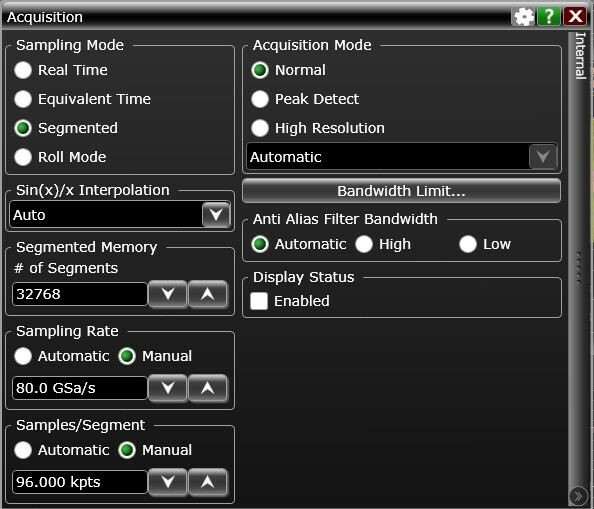 To have some margin beyond the 2-GHz modulation on the carrier, and to avoid the roll-off of the scope bandwidth, the next highest sample rate selectable is the full 80 GSa/sec of the oscilloscope for 33-GHz bandwidth capture. By using oscilloscope segmented memory, you can dramatically increase the number of pulses captured. With segmented memory mode, the 2 Gpts of memory depth can be broken into smaller segments. Each segment gets filled with captured trace after a trigger condition is met. In this case, the trigger event is still the beginning of the RF pulse, and segments can be defined to be a little longer than the longest pulse captured. For example, you can use a 1.2-μsec-wide segment size can to capture the 1-usec-wide pulses, for example. The segmented memory capture can be set up to achieve 1.2-μsec wide segments where the memory depth is chosen to be 96 kpoints and 32,768 segments, as shown in Figure 2. With this choice, up to 32k segments can be selected. Press the “Single” capture button, and 32k pulses are captured and brought into 32k segments. That corresponds to 3.3 seconds of target activity time. Is this gapless capture? No, but it is capture that focused on capturing RF pulses and ignored the time when no signal is present. Contrast this with Real Time Sampling Mode, which had 25 msec of gapless capture of 250 RF pulses. The segmented capture can be seen in Figure 3, taken on a pulsed RF signal with a 15-GHz carrier and 2-GHz-wide linear FM chirp modulation. You can even use the “Play” button to play back the 32k segments. Statistics are calculated on the 32k pulses that were captured. 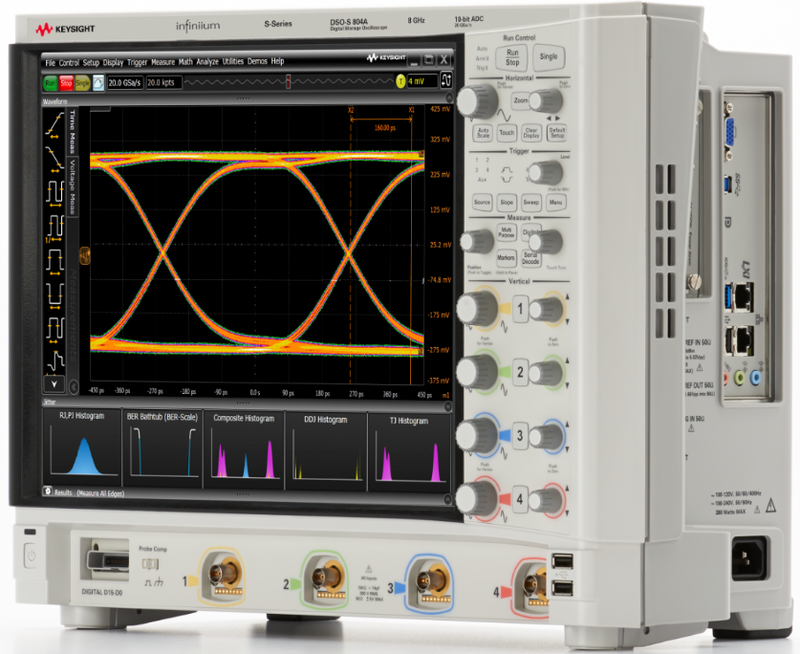 You can make similar measurements on lower frequency signals using a mid-range 8-GHz bandwidth oscilloscope. With 20-GSa/sec sampling rate on two inputs channels and 800 Msamples of memory depth, a “Single” capture can be spread across multiple memory segments. 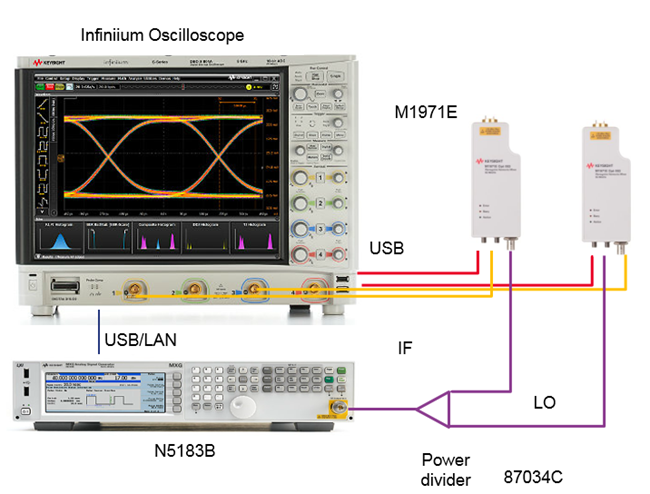 These oscilloscopes offer 10 GSa/sec sampling across four channels as well. There are also oscilloscopes with 63 GHz of bandwidth on two channels, with 160 GSa/sec sampling rate and a 2 Gpts memory depth. They offer 80 GSa/sec sampling rate capture on four channels with a 2-Gpts memory depth. You can control segmented memory with vector signal analysis (VSA) software. 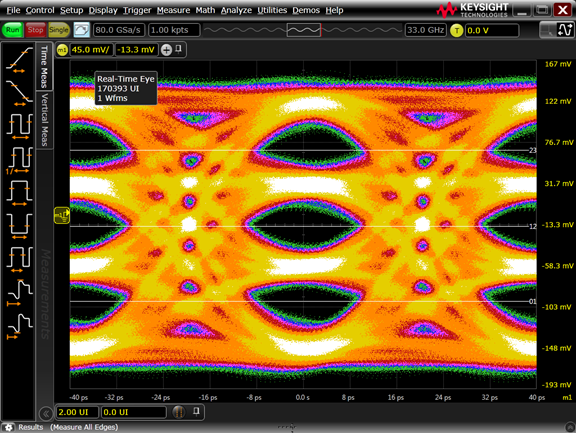 VSA lets you conduct statistical pulse analysis on many RF pulses captured into segmented memory. For example, you can perform analysis on digitally down-converted oscilloscope samples, where the format is now baseband I/Q, the measurement has been tuned to the center frequency, and a frequency analysis span is chosen to be just a little wider than the signal spectral width. This allows processing gain to reduce noise in the measurement. After noise reduction, many measurements can be taken on the I/Q data, including how the amplitude, frequency, and phase change across an RF pulse. Figure 4 shows an example of these measurements, where memory segments 3, 4, and 5 and the pulses contained in those segments are being analyzed. In this example, the linear FM chirp-frequency shift across the RF pulse is measured and compared to a best-fit linear ramp. (Check the right pane center). The difference between the measured pulse and the best-fit straight line ramp is calculated and displayed (horizontal trace with noise). You can see that the measured ramp and reference ramp have very little difference between them. The error trace is displayed with a 1 MHz/div scale and around 500-kHz peak deviation; the Freq Error RMS in the right bottom right shows around 300 kHz of frequency error. In a similar way, the phase shift across a pulse is compared to a best-fit parabolic phase shift (see right top pane), characteristic of linear FM chirp modulation on radar pulses. You can zoom in on the difference between the measured and reference to see how much a target system is deviating from the ideal. Here we see around +8 and -5 degrees peak deviation and a Phase Error RMS of 2 degrees, as shown in the bottom right table of Figure 4. The left center pane shows the spectral content of the RF pulse, the left upper pane displays a view of RF pulse envelope amplitude, and the left lower pane shows the difference between the measured amplitude envelope and a best-fit straight-line reference signal. Finally, you can perform statistical analysis on the measured parameters on the number of pulses captured into segments. In Figure 5, the statistical analysis can be seen in the pulse table based on capture of 1000 memory segments. When directly capturing wideband pulsed RF signals, the fast sampling rate required can make the capture of many pulses a challenge. The available acquisition memory gets eaten up quickly. Segmented memory is one way to address this problem by acquiring RF pulses into memory segments, and then turning off the acquisition during “quiet” time until the next RF pulse occurs. Pulse-analysis software can both control a segmented memory capture and digitally down-convert captured signals into baseband I/Q data. This effectively tunes the measurement to a specific carrier frequency with a frequency measurement span slightly wider than the signal under test—reducing noise and increasing measurement accuracy. The time required for system validation decreases thanks to the capability to compare actual, measured pulse characteristics against ideal, relative, best-fit reference signals for amplitude, frequency, and phase. With that, you can identify issues in signal creation or system performance, and overcome the challenges that battlefield scenarios present.